It’s Wednesday! Time for some StuART! I couldn’t resist using this one again. See, if I do say so myself, and I do, I think I was one cute puppy. So many puppies around these days! Check out the puppies at Rocky Creek Scottie Adventures! They’re cute, too. Each week, We share a piece of StuART with you. So come back and see what’s new every Wednesday. Or, in this case, come back and see what We’ve re-published every Wednesday. You can’t get enough Scottie art now can you? 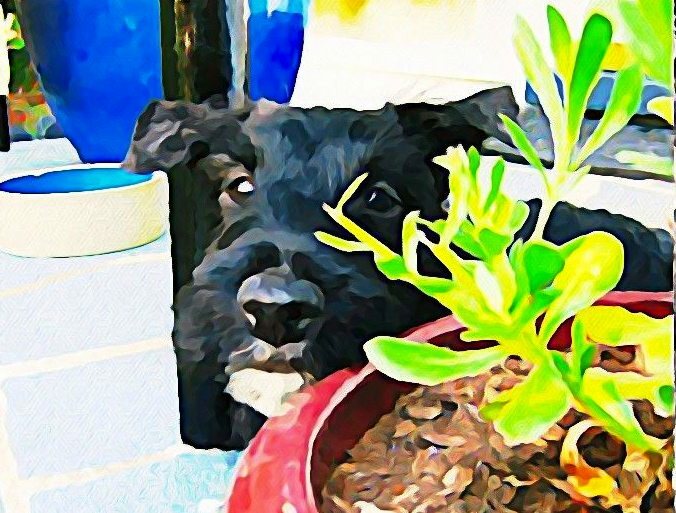 This entry was posted in The Scottie Chronicles and tagged art, dogs, paintings, Scottie dogs, Scottie puppies. Bookmark the permalink. Vibrant for a dreary day here in my city. That is a stunning painting. Adore it. It’s “the Picture of Dorian Gray” in reverse. I have the same problem. The picture never ages but unfortunately ….. .
you will always be a puppy at heart! Looking good! How old were you in this shot? Thank you! I think I was around 10- 12 weeks. Ah. Those were the day. When the ears were floppy and the nose was huge. I love this puppy pic of you Stuart. So darn cute! You are one cutey! The color values are great, too! Thanks for sharing Rocky Creek Scottie Adventures, Stuart! So nice of you, when I’m bored out of my mind because I can’t even go for a walk in the rain because of the babies. Maybe next week after their shots … or the week after that. And can you believe it, that wretched squirrel is teasing me at the window. He must know I can’t go out and get him. He’d better watch out! Such a cute baby pic! We love that picture and it looks fantastic as a watercolour! Here is another math trick This will work only with 7 digit Phone No. 1. Grab a colculatar. (You wont be able to do this in your head)2. Key in the first three digits of your phone number (NOT the area code)3. Mutiply by 804. Add 15. Mutiply by 2506. Add the last four numbers of your phone number7. Add the last four numbers of your phone number again8. Subtract 2509. Divide number by 2 Do you recognize the answer? IS’NT IT YOUR PHONE NO:? That is a great watercolor of you, Stuart! This is very nice. You look great among all those pretty colors. AHHHH one of my favorites!!! We just lurve that photo of you …. in fact all your photos are cool!